Q1. True or false: OSPFv2 supports IPv6. Answer: False. OSPFv3 supports IPv6. OSPFv2 is used in IPv4 networks. Q2. True or false: DNS AAAA records are used in IPv6 networks for name-to-IPv6-address resolution. Q3. Fill in the blank: IPv6 ND is similar to what _______ does for IPv4 networks. Q4. How many bits are there between the colons of IPv6 addresses? Q5. The first field of the IPv6 header is 4 bits in length. What binary number is it always set to? Answer: 0110. The first field of the IPv6 header is the version field. It is set to binary 0110 (6). Q6. True or false: DHCP is required for dynamic allocation of IPv6 addresses. Q7. IPv6 multicast addresses begin with what hexadecimal numbers? Q8. IPv6 link-local addresses begin with what hexadecimal prefix? Q9. True or false: ISATAP allows tunneling of IPv6 through IPv4 networks. Q10. List the eight fields of the IPv6 header. Q11. Which of the following is not an IPv6 address type? Answer: B. IPv6 address types are unicast, anycast, and multicast. Q12. True or false: The IPv6 address 2001:0:0:1234:0:0:0:abcd can be represented as 2001::1234:0:0:0:abcd and 2001:0:0:1234::abcd. Answer: True. Both compressed representations are valid. Q13. What is the subnet prefix of 2001:1:0:ab0:34:ab1:0:1/64? Q14. The IPv6 address has 128 bits. How many hexadecimal numbers does address have? 15. What type of IPv6 address is the following? Answer: It is a multicast address. All IPv6 multicast addresses begin with hexadecimal FF. Answer: C. Answers A, B, and D are incorrect because 0100 does not compact to 01. Answer B is also incorrect because 0010 does not compact to 001. Q17. When using the dual-stack backbone, which of the following statements is correct? a. The backbone routers have IPv4/IPv6 dual stacks, and end hosts do not. b. The end hosts have IPv4/IPv6 dual stacks, and backbone routers do not. c. Both the backbone routers and end hosts have IPv4/IPv6 dual stacks. d. Neither the backbone routers nor end hosts have IPv4/IPv6 dual stacks. Answer: A. The dual-stack backbone routers handle packets between IPv4 hosts and IPv6 hosts. Q18. How does a dual-stack host know which stack to use to reach a destination? a. It performs an ND, which returns the destination host type. b. It performs a DNS request that returns the IP address. If the returned address is IPv4, the host uses the IPv4 stack. If the returned address is IPv6, the host uses the IPv6 stack. c. The IPv6 stack makes a determination. If the destination is IPv4, the packet is sent to the IPv4 stack. d. The IPv4 stack makes a determination. If the destination is IPv6, the packet is sent to the IPv6 stack. Answer: B. DNS indicates which stack to use. DNS A records return IPv4 addresses. DNS AAAA records return IPv6 addresses. Q19. What protocol numbers are used by Ethernet to identify IPv4 versus IPv6? a. Protocol 6 for IPv4 and protocol 17 for IPv6. b. 0x86DD for IPv6 and 0x0800 for IPv4. c. 0x8000 for IPv4 and 0x86DD for IPv6. d. 0x0800 for both IPv4 and IPv6; they are identified in the packet layer. a. It is 40 bytes in length. b. It is of variable length. c. The Protocol Number field describes the upper-layer protocol. d. The Next Header field describes the upper-layer protocol. Q21. Which of the following is true about fragmentation? a. Routers between source and destination hosts can fragment IPv4 and IPv6 packets. b. Routers between source and destination hosts cannot fragment IPv4 and IPv6 packets. c. Routers between source and destination hosts can fragment IPv6 packets only. IPv4 packets cannot be fragmented. d. Routers between source and destination hosts can fragment IPv4 packets only. IPv6 packets cannot be fragmented. Answer: D. IPv4 packets can be fragmented by the sending host and routers. IPv6 packets are fragmented by the sending host only. 22. A packet sent to an anycast address reaches what? Answer: A. Anycast addresses reach the nearest destination in a group of hosts. Q23. Which of the following is/are true about IPv6 and IPv4 headers? a. The IPv6 header is of fixed length, and the Next Header field describes the upper-layer protocol. b. The IPv4 header is of variable length, and the Protocol field describes the upperlayer protocol. c. The IPv6 header is of fixed length, and the Protocol field describes the upperlayer protocol. Q24. An organization uses an IPv6 address range that it received from its ISP. The IPv6 addresses will be used internally, and employees will access the Internet using Port Address Translation. What is required for DNS? a. DNS servers need to support only IPv4 addresses. b. DNS servers need to support only IPv6 addresses. c. No changes are needed to the DNS servers. e. Additional DNS servers for IPv6 addresses are needed. f. DNS servers are not needed for PAT. a. Leading 0s are required. b. Two colons (::) are used to separate fields. c. Two colons (::) are used to represent successive hexadecimal fields of 0s. Q26. You have duplicate files servers at multiple locations. Which IPv6 address type allows each end station to send a request to the nearest filer server using the same destination address, regardless of the location of that end station? Q27. Which strategy allows both IPv4 and IPv6 addressing/stacks to coexist on a host to facilitate a migration? a. Deploy NAT-PT between the networks. b. Hosts run IPv4 and router run native IPv6. c. Enable anycast in the routing protocol. d. Run both IPv4 and IPv6 address stacks on devices. e. Redistribute between the IPv4 and IPv6 networks. Q28. Which strategy would be most flexible for a corporation with the following characteristics? a. Deploy NAT-PT between business and Internet networks. c. Both hosts and routers run dual stack. d. Enable anycast in the routing protocol. Answer: C. Running dual-stack IPv4 and IPv6 on hosts and routers allows for full flexibility for communications for the corporation internally, with partners, and with the Internet. Q29. What is the hierarchy for IPv6 aggregatable addresses? Q30. NAT-PT translates between what address types? a. Translate between the protocols. b. Hosts run IPv4 and routers run native IPv6. c. Encapsulate IPv6 packets into IPv4 packets. Q32. Which IPv6 feature enables routing to distribute connection requests to the nearest content server? Q33. Which statement best describes the efficiency of the IPv6 header? a. It is less efficient than the IPv4 header. b. It has the same efficiency as the IPv4 header; the larger IPv6 address makes it faster. c. It is more efficient that the IPv4 header. d. It is larger than the IPv4 header. Q34. What does one-to-nearest communication mean for IPv6? Q35. Which tunneling protocol allows dual-stack hosts to tunnel over IPv4 network that is not multicast enabled? Questions 36 through 39 are based on the following scenario and Figure. A company has an existing WAN that uses IPv4. Sites C and D use IPv4. As shown in Figure, the company plans to add two new locations (Sites A and B). The new sites will implement IPv6. The company does not want to lease more WAN circuits. Q36. What options does the company have to connect Site A to Site B? Answer: Implement a dual-stack backbone, or implement IPv4 tunnels between the sites. Q37. What mechanism needs to be implemented so that IPv6 hosts can communicate with IPv4 hosts and vice versa? Answer: NAT-PT is required to provide network address translation and protocol translation between IPv6 and IPv4 hosts. Q38. If a dual-stack backbone is implemented, do all WAN routers and all hosts need an IPv6-IPv4 dual stack? 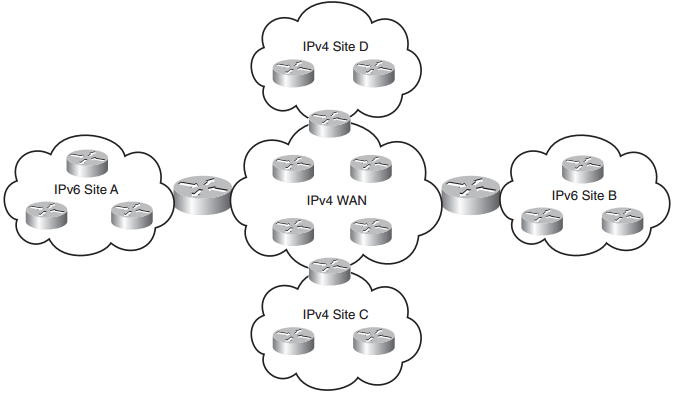 Answer: If a dual-stack backbone is implemented, only the WAN routers require an IPv6-IPv4 dual stack. End hosts do not need a dual stack. Q39. If an IPv4 tunnel is implemented between Sites A and B, do all WAN routers require an IPv6-IPv4 dual stack? Answer: No. All WAN routers still run the IPv4 stack, with two exceptions: the WAN routers at Sites A and B. These routers speak IPv6 within their sites and speak IPv4 to the WAN. Q40. IPv6 uses how many more bits for addresses than IPv4? Answer: C. IPv6 uses 128 bits for addresses, and IPv4 uses 32 bits. The difference is 96. Q41. What is the length of the IPv6 header? Answer: C. The IPv6 header is 40 bytes in length. Q42. What address type is the IPv6 address FE80::300:34BC:123F:1010? Answer: C. The defining first hexadecimal digits for link-local addresses are FE8. Q43. What are three scope types of IPv6 addresses? Answer: D. IPv6 addresses can be unicast, anycast, or multicast. Answer: B. Answers A and C are incorrect because you cannot use the double colons (::) twice. Answers C and D are also incorrect because you cannot reduce b100 to b1. a. Network Address Translation-Port Translation. Translates RFC 1918 addresses to public IPv4 addresses. b. Network Addressable Transparent-Port Translation. Translates network addresses to ports. c. Network Address Translation-Protocol Translation. Translates between IPv4 and IPv6 addresses. d. Next Address Translation–Port Translation. Answer: C. NAT-PT translates between IPv4 and IPv6 addresses. Q46. What IPv6 address scope type replaces the IPv4 broadcast address? Answer: B. The IPv6 multicast address type handles broadcasts. Q47. What is the IPv6 equivalent to 127.0.0.1? Answer: B. The IPv6 loopback address is ::1. Q48. Which of the following is an “IPv4-compatible” IPv6 address? Answer: A. IPv4-compatible IPv6 addresses have the format ::d.d.d.d. Q49. Which protocol maps names to IPv6 addresses? Q50. Which of the following are IPv6 enhancements over IPv4? Answer: B. IPv6 increases the address space, which allows globally unique IP addresses. Broadcasts are no longer used. Q51. Which of the following supports routing on IPv6 networks? Q52. What changed from the IPv4 header to the IPv6 header? a. Protocol Type became Next Header field. b. ND is used rather than ARP. c. AAAA records are used rather than A records.